We are sure hard hitters and any fans of '70s drum sounds will love the sound produced with the aid of this product. An easy way to spice up your sound. The Big Fat Snare Drum company is a US-based firm which designs and manufactures a range of snare enhancing products. It claims the Big Fat Snare Drum Pad will improve the sound of any standard snare, transforming it into something much beefier - the "highly sought-after" snare sound of the '70s. Here we have the 'Original' Big Fat Snare Drum Pad and aptly named Snare-Bourine. Both models have a 14" diameter and are made from a smooth plastic with an opaque white finish. The plastic film is around twice as thick as a standard drum head, featuring an extra black band (approx. 25mm wide), running around the entire perimeter. 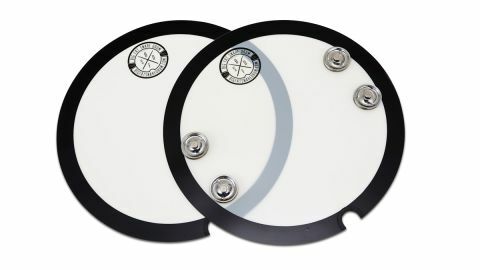 To the edge is a single, thumbsized cut-out (together with a piece of raised rubber), designed as a 'grab', allowing the player to quickly and conveniently lift the pad away from the drum for an immediate change in sound. The only difference between the original BFSD and the Snare-Bourine, is the latter has two sets of tambourine-type chimes attached by rivets. These are positioned towards the outer edge of the pad and said to give the same effect as the 'original' but with a little extra 'click' upon each strike. There are also 'Doughnut' versions of both pads - a similar basic design but with a centre section removed to allow the stick tips to make contact with the head while maintaining some of the BFSD 'thickening'. To test the BFSD discs we have two snares lined up; a 14"x5" maple and a 14"x6.5" brass shelled model. While both are fitted with Evans 'dry' heads, the maple is tuned to a relatively high pitch, whereas the brass is both physically and tonally deeper. Placing either snare pad in position is ultra-rapid - simply throw it on and they are ready to rock'n'roll. When striking either of the snares using medium to hard strokes, the sound is impressively fat, instantly drum changing - as if we have put an entirely different pair of snares into the basket! With either disc in position, the pitch and tone of the drum are effectively lowered and the pitch of either snare reduced by around a whole tone. This fattens up the sound while removing any possible traces of overtone - a recording engineer's dream? There is little noticeable difference in stick response or any alteration necessary in technique when hard hitting. But playing with a little more finesse, the response doesn't quite match a standard head. The Snare-Bourine does help in this regard, adding a touch of delicacy to the performance. The two plastic layers tend to reduce the snappy response and we think this is where the 'doughnut' versions would come into play, satisfying those looking for just a little compromise.